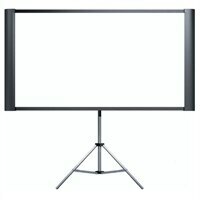 The first ultra portable projection screen to offer both standard (4: 3) and widescreen (16: 9) formats, the Duet ultra portable projection screen from Accolade provides the perfect solution for both business presentations and home theater applications. Use the included floor stand to set up your screen. Or, mount it to the wall with the included bracket. Then, pull the screen out to the size that works best for you, 65 inches for standard viewing or 80 inches for widescreen viewing. With the innovative, patent-pending, design, setup couldn't be easier. In no time at all, you'll be ready to sit back and enjoy brilliant images on a bright white screen. When it's time to shut down, Duet stores quickly and easily.